Fortunately, the Peter J. Shields Library provided Gilson with a place where he could concentrate on his studies. From there he earned success in the classroom, grew in confidence and went on to enjoy a thriving global career in the aerospace and defense industries. Through his work, Gilson has lived or worked in more than 40 countries to date, from Pakistan to France to China. But Shields Library, according to Gilson, is where it all started. 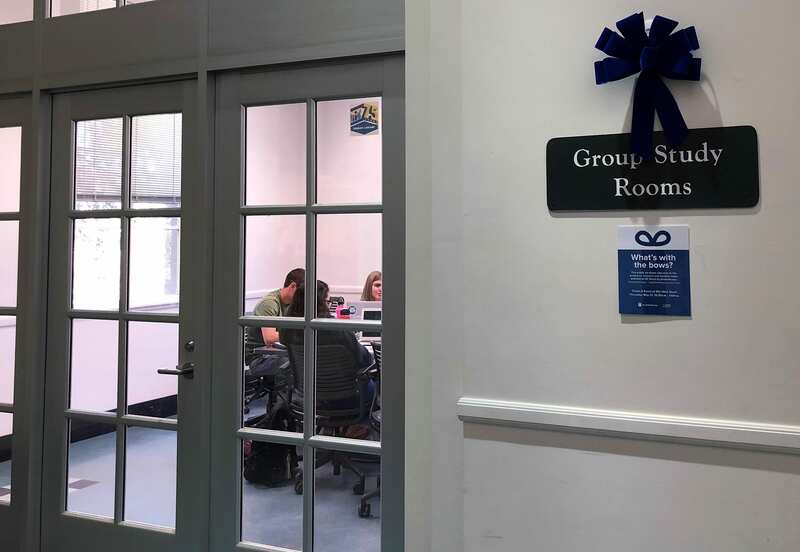 A “byPhilanthropy” bow outside of the two refurbished Group Study Rooms on the second floor of Shields Library acknowledged the Gilsons’ generosity. Shields Library played such an important role in the foundation of Gilson’s success that he and his wife decided to make major gifts to support the transformation of several of its study areas. Their hope is that their philanthropic support will foster greater opportunities for students to study and collaborate on projects. Two of the group study rooms, which once contained large tables with hard chairs, are now dynamic workspaces filled with comfortable seating and state-of-the-art monitors to facilitate group work on presentations and projects. In addition to his and his wife’s financial support, Gilson volunteers his time serving as the founding chair of the UC Davis Library’s Leadership Board. He says he’s been inspired to be part of driving the library’s vision forward under the leadership of MacKenzie Smith, university librarian and vice provost of digital scholarship. This vision includes rethinking the space in the library’s physical facilities to better accommodate a modern learning environment, expanding online and digital services to position UC Davis as a global leader in digital scholarship and archiving, and enhancing library services for the library’s 1.6 million annual visitors. Gilson is no stranger to the metamorphosis of libraries. He led an effort to transform the library in his current hometown of Lafayette, California into the Lafayette Library and Learning Center. As the chair of the volunteer board, Gilson successfully led the project from the idea phase, through the approval process and major fundraising phase, to construction and eventually to the building’s opening. Thanks in part to his efforts, the town’s 5,000-square-foot public library was converted into a 32,000-square-foot learning center that abounds with community enrichment and learning programs for people of all ages and is the crown jewel of his community. “We had no idea how successful of a project it was going to be until we opened it. We soon saw how the community was finding all kinds of new ways to use the space, beyond what we had envisioned,” Gilson said. Gilson says he’s excited to be supporting the library as a collaborative learning environment that goes beyond books. Because of his own student experience, Gilson appreciates the library’s important role in student success as a space to study, work on group projects and learn how to conduct academic research. Now, as an alumnus and donor, Gilson also acknowledges the importance of the library’s partnership with colleges and schools at UC Davis, as well as with the academic community around the U.S. and world. It is that expansive mission that, in Gilson’s view, demonstrates the UC Davis Library “has what it takes” to be a leader for the academic community at UC Davis and beyond, and it is something he and his wife are happy to support.